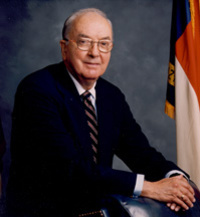 Jesse Alexander Helms, Jr. (October 18, 1921 " July 4, 2008) was a five-term Republican United States Senator from North Carolina who served as chairman of the Senate Foreign Relations Committee from 1995 to 2001. A leading conservative, he helped organize and fund the conservative resurgence in the 1970s, aiding Ronald Reagan's quest for the White House and helping many local and regional candidates. A journalist by training, Helms was the longest-serving popularly elected Senator in North Carolina's history, and was widely credited with shifting the one-party state dominated by the Democrats into a competitive two-party state. The Helms-controlled National Congressional Club's state-of-the-art direct mail operation raised millions for Helms and other conservative candidates allowing Helms to outspend his opponents in most of his campaigns. This webpage uses material from the Wikipedia article "Jesse_Helms" and is licensed under the GNU Free Documentation License. Reality TV World is not responsible for any errors or omissions the Wikipedia article may contain.